Sturdy And Durable. Ideal For Commercial, Light Institutional And Home Use. Max Load Should Not Exceed 390lbs. Range Of 42" To 67" - Accommodates Bench Press. Heavy-Duty Steel Construction. Excellent For Press Squat Stand. Ideal For Pressing, Bench Or Standing. Safety Spotters On Each Post Can Be Adjusted Accordingly. Specifications Weight: 40 Lbs. Max Load: 330 Lbs. 50*50*1.5mm Square Tube. Inner Square Tube Size: 45x45x1.5mm. Adjustabe Height: 42'' - 63.8''. Whole Size: 20"(L) X 19"(W) X 42"-63.8" (H). 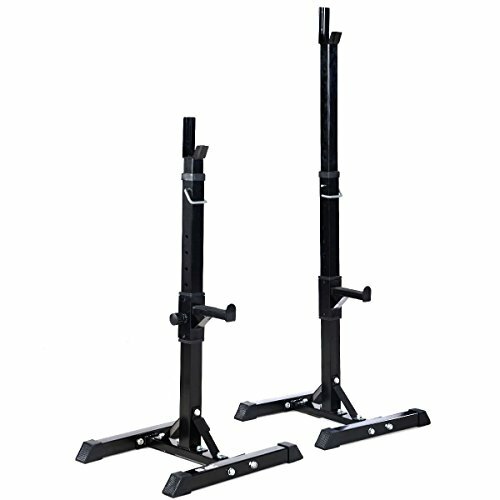 Package Include: 1 Pair X Barbell Stand (Need Assembled).